We grow your business through building loyal customer relationships. Find & inspire your loyal promoters to refer you to their friends and family. Keep clients engaged with meaningful communication so they think less of the price and more of the value you bring. Grow online reputation and drive warm prospects to your door by collecting and sharing positive testimonials and reviews. You'll see results right away. Quickly identify your most loyal clients and inspire them to refer you to their friends and family. Grow your online reputation on popular sites like Google and Yelp by collecting testimonials and positive reviews from your top promoters. Make your clients smile and build strong personal relationships by sending them personalized handwritten cards (without the writers cramp). Never forget another piece of communication. We know what to say, when to say it; and automatically send it for you. 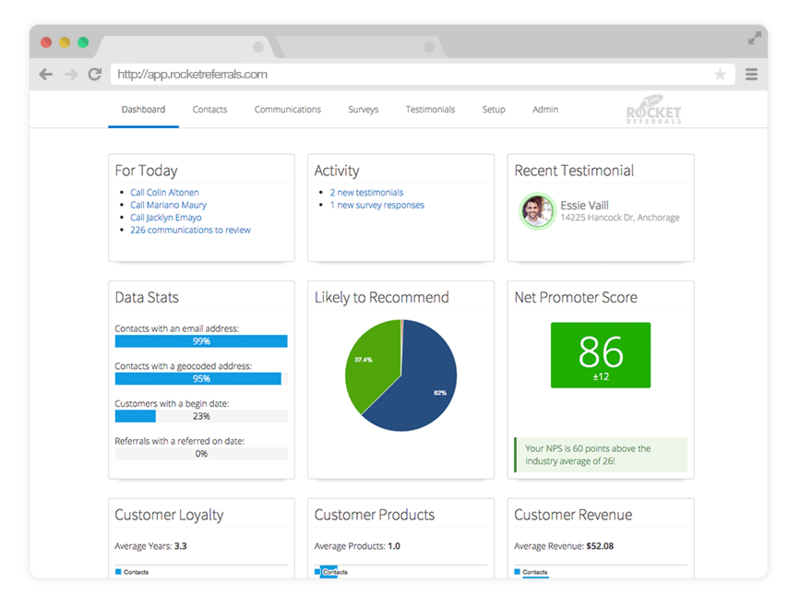 Dramatically increase retention and cross sales through our personalized and automated touchpoints. Writer’s block no more. Use our prewritten content and reach your clients with effective, and personalized communication at the push of a button. Listen to the folks who already trust us with their clients. Rocket Referrals is excellent at finding my most loyal clients and getting them to recommend my agency to others. In my industry, referrals are king and this is the best platform for generating ‘pre-sold’ prospects. Rocket Referrals is awesome. They do a great job keeping my existing clients engaged so that I can focus on selling insurance. My clients are constantly thanking me for the handwritten cards they get. We’ve collected even more testimonials with our own system. Check them out. Rocket Referrals will work directly with your management system. Put your referral and retention strategy on autopilot. Sign up today and start seeing results almost immediately. Is Rocket Referrals right for your business? Let us show you Rocket Referrals in action.